The Buenos Aires Argentina Temple is the 39th operating temple of The Church of Jesus Christ of Latter-day Saints (LDS Church), located in Ciudad Evita, near Buenos Aires, Argentina. LDS Church leaders announced plans to build a temple in Buenos Aires in April 1980. Three years later, ground was broken and the site was dedicated by Bruce R. McConkie. After the building's completion an open house was held from December 17–24, 1985. 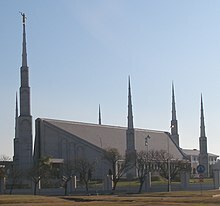 Because of the location, visitors traveling from the airport to downtown Buenos Aires drive right past the temple. Thomas S. Monson presided over the temple dedication on January 17, 1986. The Buenos Aires Argentina Temple has a total of 17,683 square feet (1,642.8 m2), four ordinance rooms, and three sealing rooms. The temple closed for a renovation and expansion that added two smaller wings to the temple, set at angles to the existing structure. The renovated temple was rededicated September 9,2012 by Henry B. Eyring, First Counselor in the church's First Presidency. It reopened September 11, 2012. ^ "Buenos Aires temple to close in November". Church News. September 12, 2009. Retrieved March 28, 2011.